Dumbleton on 29 December 1935, turning gendarmes on the south-eastern side of the ridge. 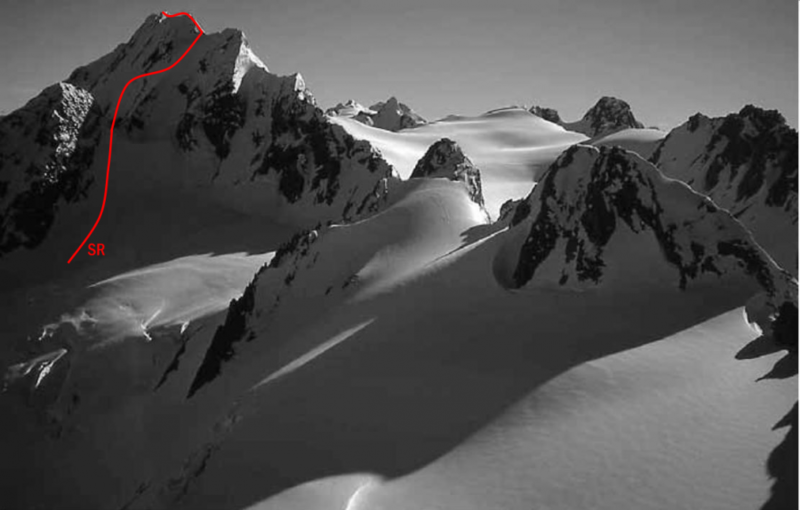 At the head of the Grey Glacier climb up to two detached rocks at the base of the third buttress east of the peak, then ascend the rock rib to the Main Divide. As an alternative, head up snow slopes west of the detached rocks to the Main Divide, then traverse the serrated ridge turning gendarmes on the south. The first peak is considered the summit. From the Butler River head up the valley draining Grey Pass, initially sidling on the true right to reach the basin above the 1100-metre contour. At about 1600 metres, head south-west over rock to a reach a snow shelf at about 1800 metres. Head south up a steeper band of slabby rock to the left of a small buttress and continue over a rib to the eastern edge of the permanent snow slope north of the peak at about 2100 metres. Continue up rock and snow bands left of the main snow gully, reaching the Main Divide at about 2480 metres. Snowslopes lead to the summit. Access the Nansen névé from the South Butler Valley. From the sharp col between Pt 2413 metres and Pt 2540 metres, steep firm rock on the first ascent (but steep snow slopes on a subsequent one), led to the Main Divide. Traverse over various small summits along the narrow and exposed South (Divide) Ridge. A step on the ridge is reportedly less difficult than it looks.